I began painting several decades ago. I started taking community workshops in oil painting when I was a highschool student in a small northern Canadian town. I was part of the baby boom generation that created a bulge in the school system. There were more students than classrooms or teachers. During my elementary school years, it was typical to be placed in classes of 40-42 students. We pushed our desks together to make double rows so that we could all fit into a standard-sized classroom. By the time that I reached junior and senior high school, the demographic bulge was putting pressure on the availability of elective courses. For example, in Grade 8, there were not enough spaces in Home Economics classes, so a few girls were allowed to opt to take shop classes instead, for the first time ever. One of the ways that the bulge affected me is that my highschool discontinued offering Art 11 and 12, and the teacher was reassigned to teach other courses. I always had loved doing art, and was disappointed that I would not be able to take Art as an elective in highschool. So, I signed up for evening adult art classes. My parents bought me a portable easel, and I used my babysitting money to invest in a starter set of paints, brushes, and canvas boards. 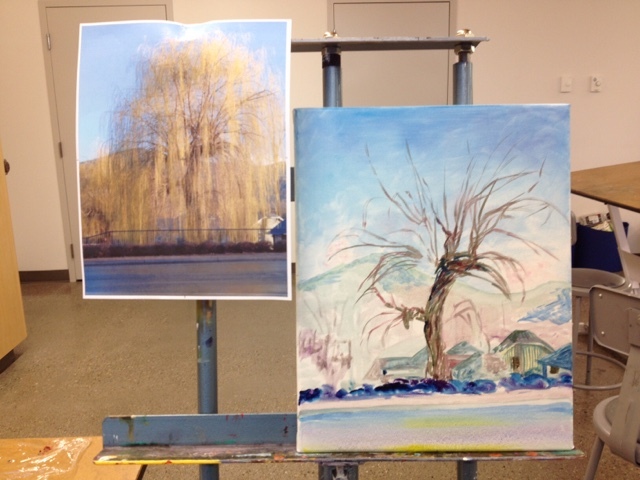 Our instructor, Quentin Robbins, taught us the basics of oil painting. On wintery nights, we painted a series of still life scenes that he set up for us, or scenes from photos. However, Quentin's real passion was painting landscapes. He especially like to paint rural scenes of old tumbledown barns. I discovered that I too loved to paint landscapes. I continued to sign up for painting workshops as a teenager. However, after I left my hometown, I rarely had opportunities to paint. Sometimes a decade would go by between periods of painting. But this last five years, I have made it a priority to find time to paint. I haven't painted as much as I would like -- maybe 2-3 hours a week or every two weeks. One of my new discoveries has been en plein air painting. I love to stand outside in a field or near the mountains, painting. One truly gets a sense of a place by painting on location. Sure, there are bugs, wind, changing light, and weather to contend with. But it is such an intense experience. 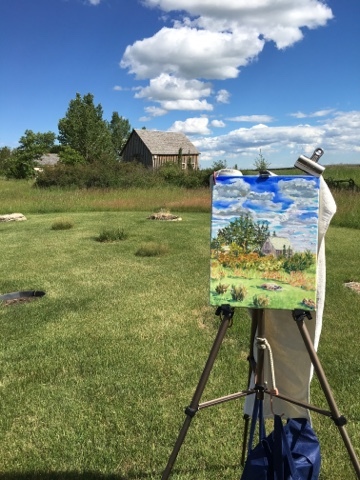 A couple of weekends ago, I attended a plein air paintout at the Coutt's Centre for Western Heritage in southern Alberta. 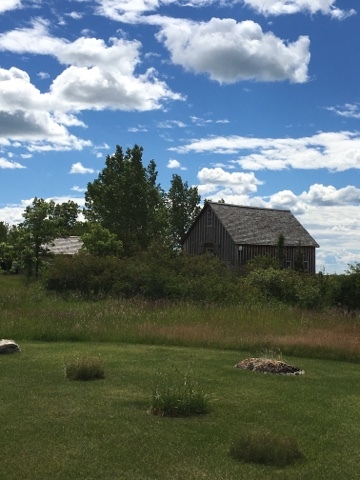 It is a family homestead that Jim Coutts donated to create a heritage centre. It is a spectacular location for painting outdoors, with a number of heritage houses and barns on the homestead, gardens, fruit trees, wooded areas, and a pond. The mountains are visible in the distance, and there are many sculpture pieces tucked away along the various pathways. I set my easel up at the edge of a lawn dotted with large boulders. They were arranged similarly to a sundial, but one of the other guests told me that he believed that they represented a teepee ring. Beyond the circle was an area of tall grass, then bushes, and behind that a barn, trees, and sky. Because I wanted to finish my painting during the day, I used a small canvas, 11x14 inches. Although I prefer to paint larger, I have found through experience that that I cannot a finish a painting in one session if I start with a larger canvas. My position behind a large cluster of bushes was perfect; it protected me from the wind which otherwise might have blown my easel over. The only problem was that there was no shade there, so I was standing in full sun all day. However, I slathered myself with sunscreen and went to work. It was a magical day. Although I find that my plein air landscapes have a rougher, less finished look, there is nothing like the experience of being immersed in the landscape and really looking closely at it. I also have started a small studio painting recently. It is from a photo that I took in Grand Forks, BC, in the springtime. A couple of large weeping willow trees near the river were just coming into leaf. The evening sun illuminated them, creating a brilliant yellow flow of colour. I haven't gotten far with that one yet. My painting time has been limited with all the of business of buying and selling houses and preparing to move. Painting is a wonderful mental holiday from everyday tasks and worries. Landscapes, to me, represent something important about Canada. This is why I am writing about landscape painting on Canada's 150th birthday. Hi, Jude - I am always very thankful for inspiring teachers like Quentin Robbins! Thank you so much for sharing this at #BloggingGrandmothersLinkParty. I can't wait to see your paintings up close very soon! Hi Donna. Since my first positive experience with community workshops, I have signed up for a number of them over the years (and taught some). I am grateful for each different artist from whom I have learned. Each one has had something unique to impart. I would love to be able to paint but alas I can't even draw a stick figure. I love your work and thanks for sharing at #BloggingGrandmothersLinkParty. Have a beautiful day. Sue, thanks for your kind words. I do think that every person has the potential to be creative. You just have to find the specific domain that inspires you the most. Also, it takes time to learn and practice the basic skills in the discipline that you have chosen. Oh how talented you are! Very nice. I so wish I could draw or paint. Thank you Jude for linking up at the #BloggingGrandmothersLinkParty. I shared this post. Thanks so much for your comment, Grammy Dee. And thanks for sharing this post. Your paintings are beautiful! And the idea of standing outside all day to capture a scene is fascinating. You make me want to take an art class, and I might just do it after I retire. I like the idea of losing oneself in the activity and forgetting all else. Also the scenery reminds me of northern Maine where I grew up. Lovely. #BloggingGrandmothersLinkParty. Molly, thank-you. Yes, it is the experience and process of plein air painting that is so wonderful, not necessarily the final product. But when I look at the painting, the experience of that day comes rushing back to me. I do encourage you to take an art class. In the art classes I have been in over the years, the students predominantly have been retirees, many of them taking their first art class ever. I have found it to be a welcoming and mutually supportive learning environment. Beautiful work. Whenever I see a beautiful landscape or sunset, I always think, "If only I could paint." Just this weekend, I was driving through the small town of Midway, Utah and saw several painters set up in fields and on the side of the road, capturing the beauty. Thanks for linking up at #BloggingGrandmothersLinkParty. Christie, thank you. Yes, one of the things I like about travelling is staring out at the landscape (especially if I am not the one driving!!). I have found that being a painter makes me look at the landscape differently and more closely. I notice things that I wouldn't otherwise see, and I'm always thinking about how to represent the forms and colours that I see, or how the light is angled, or the pattern that branches make against the sky. Painting on location hones observational skills even more (even though I am not always very successful at representing what I see and feel. Thanks for this post, Jude. It was fascinating to read your history with painting. I especially like the twist in the road that required you to access adult art classes. I love those little moments that reorient a life, and am so glad that one happened to you or maybe we wouldn't have your paintings. Karen, such a great observation. Sometimes troubles in life jolt us into seeing things a different way or making decisions that take us down an unexpected path. Although it is hard to remember that wisdom in the middle of a problem, in retrospect it appears obvious. I have had the occasion to be grateful (after the fact) for quite a number of problems in my life. No Art classes in high school is one of them. Very nice work! Thank you for sharing at ‪#BloggingGrandmothersLinkParty‬. Lori, thank you. I am glad that you like it. Wow...you are so very talented. Each painting is more beautiful than the other.Thanks for sharing at #BloggingGrandmothersLinkParty. Clearissa, thank you for your kind words. I echo all the other posters here about your talents (and I appreciate that you think we all have them!) Clearly I need to "practice" more because I struggle with stick figures too. Just beautiful! Looking forward to hearing about your moving adventures as time goes on. Vicki, thank you. I have heard art teachers say that anyone can learn to draw if they are taught the basic principles, and practice lots. Of course, it starts with having the confidence to try! I have loved to draw ever since I was a small child, and always had a pencil in my hand, doodling. It is a good thing to have outlets like are and writing, especially during stressful life events like retirement, real estate deals, and moving! I hope your renovation projects move forward in a timely way. I meant to say "art." Your landscape paintings are beautiful! You're very talented and blessed to be able to create beauty in this way. Thanks for sharing. BTW - I, too, was a member of that baby boom bulge in public schools. Our schools were so crowded that our elementary school had 2 shifts everyday: morning and afternoon. So, I only attended school a half-day up through the 3rd grade. It wasn't until I was 9 years old that I actually attended all-day school. Somehow, I ended up being a college professor with a doctorate degree -- ha-ha. Thank you for linking up at #BloggingGrandmothersLinkParty. I’m sharing your link on social media. Yes, I think many of us had interesting school experiences being part of that demographic bulge. My school district hired many teachers from Australia because Canadian teacher education programs could not prepare enough teachers quickly enough to meet the need. So we had quite a few Social Studies classes focused on the culture and history of Australia. Thanks for responding via #BloggingGrandmothersLinkParty, and for sharing this link. I find your paintings very lovely! I would love to be able to paint, but I have no artistic talent in the way of drawing or painting. Thank you for linking up your talent at the #BloggingGrandmothersLinkParty! Thank you for the compliment. Nice to meet you through #BloggingGrandmothersLinkParty. Awesome Painting.. Keep up the good work. Thank you. I hope to set up a studio in my new house, but presently everything is still in boxes.